So how did it go? That is usually the question I am asking all of my clients today! Most of the people I met look at their "diet" as a battle and something that they must come to be able to control or conquer... I am not sure if that is truly possible. Food is the one of those things in life that you cannot live without. Having the mentality that you will conquer it, I believe, will only lead to failure... Now I know that sounds a little grim, but think about it! Have you had times where you started a new diet or attempted to integrate new habits and you made it an all or nothing type of deal... Did it last? Having the mentality of all or nothing when it comes to your nutrition is detrimental to reaching your goals. This is a lifelong marathon, not a sprint, to reaching your nutrition goals. So I am just going to say it! It's ok to enjoy food and even those foods that you feel you should stay away from! When I use to work for a private practice that helped individuals lose large amounts of weight I would hear people tell me all the time that they were focused 100% on their nutrition.. right now! That is when I would cringe... Those two words "right now!" I would then question them to what the future would look like and how much time/energy they believed they would have to put in to maintain their nutrition goals. Many would say that it was not something they had thought about or would think about until that time.. well these would be the individuals that would not maintain their nutrition goals! That might sound harsh, BUT its true. You must always stay focused on your nutrition goals. I am not saying that you should be strict all the time and take away the enjoyment from food... What I am saying is this is a relationship - one full of give and take. You must find a balance of where you want to be and what is realistic. Everything cannot change over night and to tell yourself "you will never..." will only lead down a slippery slope. SO... instead could we try to look at it this way. Set your goals and stay firm to them! Now set 3 things you will start to implement today that will start leading to your goal. Lastly, here is the part most people just write off when I say.. now choose 2 things you will keep and allow yourself that you enjoy. Personally, I want to share with you what that looks like in my life... All the time people will say that I must have it all figured out since I am a dietitian... HA! I am human and I like food just as much as the next person ... so no unfortunately I have not figured it all out yet! I practice what I tell each of my clients - if I do not do it or could not do it, then I do not even think of suggesting it! For years I would tell myself that I had to get control of the love I have for chocolate. I tried taking it out of my diet completely, having it once a week (which lead to eating way too much in one sitting), or moderating what I could have on what days.. let me tell you none of this worked! I realized that trying to tell myself I "would not" only set myself up for failure. Instead, I have made changes in which I have chocolate almost always in my home, but I have selected "healthier" chocolate such as dark chocolate and I buy them in the squares so I can moderate the amount I have. I never tell myself I cannot have it, but to be aware of how much. This has worked for me - you must do the same for you! So if you think you over did it at Thanksgiving - thats ok! You lived and you learned! Today, let's move forward learning how to moderate and enjoy the foods you love while pushing towards your nutrition goal! 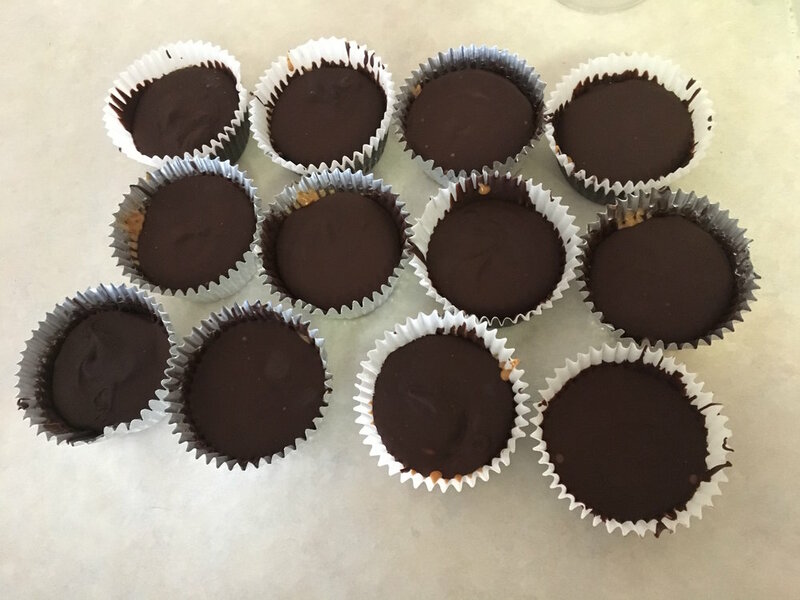 Oh, and if your like me who needs a little chocolate fix every now and then... here is a recipe below to give you a healthier chocolate snack! * I like to keep my in the freezer till I take mine out for a snack! I also like to use the mini muffin tins as I like to have the smaller bit size, but this is completely up to you! Ready to get start? Have more questions? Do not hesitate to reach out! We are always here and we are ready to help you in any way possible! Contact us using the button below and we can help you decide what nutrition or fitness plan is right for you based on your health goals, physical limitations, and more.